I first thought of writing this guide a few months before getting 200M ranged xp and started to do so when I was at around 150M ranged xp. Having reached the ranging pinnacle, it is now right to release this guide and, hopefully, contribute to the RS ranging scene. Along the way, I have met hundreds of fellow chinners, many of whom chinned using grossly inefficient methods. My spots have also been stolen for what must have been around a hundred times, and I think this is unbecoming of responsible and considerate Runescapers. So, unfortunate as it may be, this guide tries not only to impart efficient chinning strategies, but also etiquette. By reading this guide you agree not to steal the spot of a fellow chinner. As stated in the title, I have made this guide as comprehensive as possible, including all the tips and tricks I have learnt along the way. This guide has taken many hours to write, and it will take that and more to read, internalise and incorporate into your chinning style. I have a proclivity to write in a rather long-winded fashion, and it is my hope that this guide does not become boring as a result, and indeed that it will help you in your ranging endeavours. As you may have noticed, there are more cons than pros. However, the pros enable ranged xp to be obtained at a rate vastly superior to all other methods, and this is what is most important. Furthermore, the cons are rather insignificant, and they can be easily reduced or indeed negated through experience. 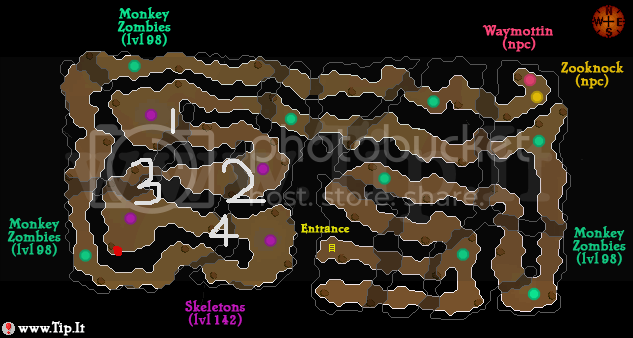 Note1: Skeletons will regularly regenerate from their bones if and only if you are within 2 adjacent squares of them. Note2: Regenerated skeletons have a propensity to spontaneously combust, and they will do so if you do not kill them fast enough. where n is one's earning capacity, measured in terms of gp/hr. The derivation of 1.2977 is unimportant and independent of one's ranging level, equipment, or ranging style. We shall call it the Ranging Constant. Total cost is calculated by adding up chinchompa cost and potion cost. As a general estimate about 1300 chinchompas are used per hour, while the number of potions used depends of course on one's ranging and prayer levels. If the relative efficiency of red chinchompas is greater than 1, then they should be used; otherwise, grey chinchompas should be used, assuming that there are no feasible non-chinchompa methods of training ranging. You should ensure that you have enough energy to run through the entire dungeon. There are 4 main chinning spots in the Ape Atoll dungeon, each characterised by the granitic rock overhangs that give the chinner a brief respite from the constant perils of Hominoidean antagonism. I shall refer to these 4 spots simply by their relative proximity to the entrance, spots 1-4. It is worth noting that it is not necessary to chin under a rock overhang. Indeed, some people do not do so. However, as there are no benefits of not doing so (and indeed many detriments), and as the best chinning spot just happens to be under an overhang, it is advised that you just stick with spot 3. It is advisable to log out your character at the red spot indicated on the map. 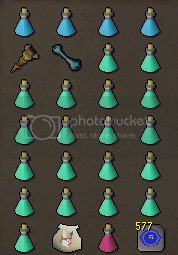 Before logging, you should fill your inventory with as many bones as you can. When you log back in, you can drop the bones in a 3x3 matrix, and the skeletons will regenerate therefrom once you have killed 1 skeleton. This will save you from having to kill many skeletons before you have a sizable population of them. Like most things, monkey skeletons respawn faster on fuller worlds. The fullness of the world, however, has no effect on the bone regeneration time, and as most of the monkeys you kill will be regenerated ones, the world matters less than one might think. A good spot on a bad world is better than a bad spot on a good world. There is some debate over what kind of familiar is best to use (some even use none). Healing familiars are useful only to the inexperienced chinner and so should not be considered at all by those familiar with the intricacies of the skill (no pun intended). This leaves BOBs and combat familiars. The best BOBs enable you to last twice as long each trip. This equates to about 4 minutes saved per hour. The best familiar available at that level can gain you xp equal to far more than 4 minutes every hour. Therefore, combat familiars are recommended. When deciding which combat familiar to use, I think the crux is on what skill it trains rather than its combat level. I personally use the Wolpertinger because I value magic xp more than any other regular combat xp. Attack style should be set to short fuse. Medium fuse uses the Chinchompas at a faster rate, but this is overridden by the fact that you will be missing more often. Long fuses trains both ranged and defense. 1. Ensure that the skeletons are as far spread out as possible, ideally in a 3x3 square. This is because only 1 bone can regenerate at each spot at any one time. Sometimes, despite your best efforts, the bones will still conglomerate on certain spots. In such cases, it may be necessary to manually spread the bones around. I prefer to diagonally range the skeletons as opposed to attacking the skeleton in front of me, as this better allows the bones to spread as well as facilitate movement from corner to corner. Sometimes, the best spot to stand on happens to be not under a rock overhang, meaning that you will take damage from falling rocks. As you become more experienced, you will find that being on low health is not a problem, and hence you should stand on such spots. I used to finish my chinning trips with 200 LP or less. As it is difficult to explain how to chin in words alone, I shall leave it to the following video to do so. I only regain the skeletons' aggression when someone runs by and attracts them. 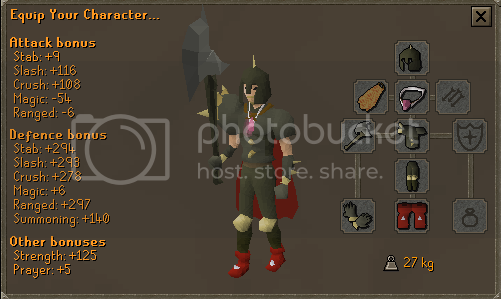 At lvl 99, one can get up to 280 xp/red chin, and 360K xp/hr. At lvl n for all n > 70, one can get up to 280(n/99)^1.1 xp/red chin, and 360K(n/99)^1.1 xp/hr. For grey chinchompas, multiply the above numbers by three quarters. The usage of combat familiars can add up to about 20K xp/hr. The combat training method described herein is expensive in its own right and provides no benefit to the user apart from the perhaps unparalleled possibility of rapid xp gains. More than having merely a monetary factor, it requires sustained concentration, failing which an expensive trip to Lumbridge is surely guaranteed. This method is not for the faint of heart, for the prospect of having millions of gp dangling precariously on a string of single digit LPs will surely be too much to bear. This guide is for the efficiency-seeking, death-indifferent people of Runescape. Their numbers count uncountable. It is these who hold the future in their hands. Note3: Skeletons do NOT drop ancient effigies. Since many other worthwhile training spots (e.g. 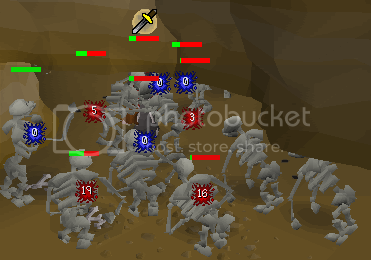 armoured zombies) do drop them, Dharoking is no longer as lucrative as it used to be. (Optional) A whip to finish off the skeletons when they are low on health. This will further increase your xp/hr. At lvl 99 attack and strength, without switching to a whip and without familiars, one can get up to 130K xp/hr. Using the whip-switch method, one can add about 15K xp/hr. Combat familiars can add up to about 20K xp/hr. 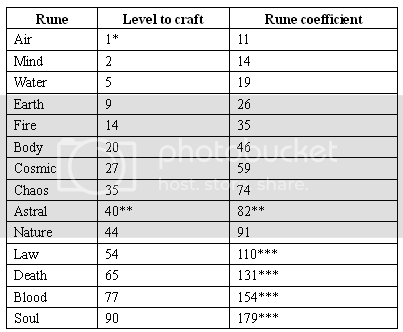 This guide is intended to help readers to calculate levels required to craft (multiple) runes mathematically, instead of checking guides as is usually the case. Through this, not only can the levels required be obtained more quickly, they can also be obtained when offline. 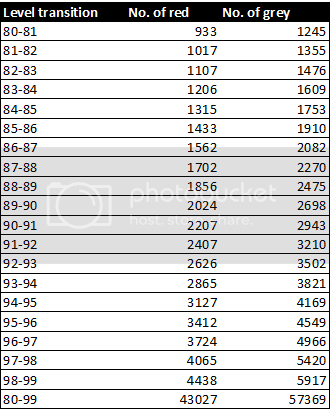 It is the expressed goal of this guide to awaken Runecrafters to the fact that Runecrafting level requirements are not randomly chosen as is perhaps often thought to be the case, and in so doing discover the underlying mathematics behind it. *Using the formula, L is undefined. As L is the lowest level rune, it requires the lowest Runecrafting level to craft, i.e. 1. **The formulae do not work for Astral runes as they were not part of the original runes. The levels for them thus cannot be mathematically derived. ***Theoretically, since levels obviously do not go beyond 99. Since I am no longer concerned about accusations of being a 'grammar Nazi' (which really isn't a pejorative at all), I shall let loose my pedantic diatribes and attempt to address the growing misuse of the English language. Could have/ should have/ would have NOT could of/ should of/ would of -- It is remarkable how often this blatant error is made. It should be quite obvious that using 'of' instead of 'have' makes absolutely no sense. Their/ they're/ there -- Again, it is remarkable how many people are unable to correctly distinguish between the three. 'Their' indicates possession (e.g. their clan), 'they're' means 'they are' (e.g. they're busy), and 'there' has many meanings, none of which is even remotely close to the meanings of the two previous words. Your/ you're -- 'Your' indicates possession (e.g. your scimitar) while 'you're' means 'you are' (e.g. you're welcome). Whose/ who's -- 'Whose' indicates possession (e.g. whose longsword is this?) while 'who's' means 'who is' (e.g. who's keying?). Misuse of the apostrophe -- The apostrophe is almost only used to denote contracted terms (e.g. 'they've' is the contracted form of 'they have') or denote possession (e.g. Zamorak's army refers to the army of Zamorak). It is incorrect to use the apostrophe to indicate pluralisation, so phrases such as 'buying Chinchompa's' or 'selling battleaxe's' are wrong. Gilded altar NOT guilded alter -- To gild is to cover with gold while an altar is a place for offering sacrifices. Lose vs loose -- These words have entirely different meanings. Generally, people mistake 'loose' for 'lose' (e.g. it should be 'I will lose' not 'I will loose'). Definitely -- This is quite possibly the most commonly misspelt word around. I have seen a variety of misspellings such as 'definately', 'defanately', and even 'defiantly' (which has an entirely different meaning). Feel free to post any comments, questions, corrections or suchlike. I regret that I may be unable to respond promptly. I like the choice of songs in the vids. Other than that, one of the best guides that I have seen so far! Excellent guide, your explanation is as clear as it can be and the videos enlighten me even more =D> now off-topic for a second: what piano compositions did you use in those videos? I absolutely loved the background music. Chuck Norris doesn't ever need a compass; he randomly points somewhere and north goes there in order not to anger him. 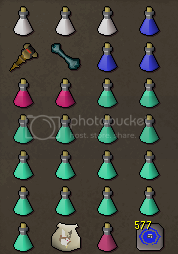 The only flax I could find: In the melee inventory you bring a summoning potion, it would be more efficient to bring a super restore instead of one prayer potion, super restores restore summoning points too. Do you have any info on how void melee and a whip compares to dharoks there? Very nice guide. However, if you're seeking efficiency then slayer is best for raising total xp as slayer and summoning xp comes along with it - I guess this is if you want 200m xp as quickly as possible. 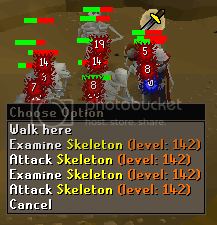 For those skeletons with dharoks, wouldn't a rock cake be useful? It allows you to get onto exactly 2hp and doesn't interrupt combat I believe. Or would this be too much hassle? Thanks alot, especially for the ranged info! 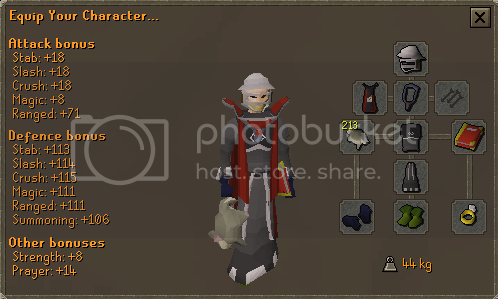 Didn't realise red chins weren't that much better than grey ones. Amazing. I really never thought of picking up bones and moving them to a certain spot as I thought they wouldn't work. Congratulations on the achievements and superb guide. I'm faster than bots at Sorceress Garden. PM me if you want to chat. My PM is always off. My keyboard is on fire. Want some? I could not have said it any better. Thank you Chenjs2!! Not really, but I wouldn't expect it to be nearly as effective. The whole point of using the spot is so that the falling rocks and [bleep]e traps can keep your health low for Dharoking, so if you are using other setups there are other undead monsters you can kill that are much more accessible and perhaps more efficient as well. I don't think it would be needed at all since your health would be kept low permanently and effortlessly by the falling rocks. Using the spot frees you from the need to do anything special to keep your health low. Indeed it is, one of my favourite compositions too. Great guide, do you have any idea how much it costs per hour? I'm just wondering, it'd be great if you could mention it. Very nicecly explained and all. I recently made a guide on chinning myself and it's handy to see what things I missed (or you missed). Gonna update my guide soon lol. good guide but i dont think the melee one is good. why? "your karil's leatherbody has degraded to 100%" or something like that, and that's because of the trolls. so that leads me to believe that its not the amount of time YOU hit them but the other way round(i think). now in the dungeon you will be attacked my lots of monkeys hence wouldn't that make your armour degrade very very quickly? im quiet sure what i said is right but you can confirm it if you'd like. even i have the misfile craze!!! Since I'm on dial-up I cannot view your video, so if you answer my question I apologize. Anyway, do you use Eagle eye while chinning, or Piety while dharoking Monkey skeletons? I'm curious if you have found the extra expense to be worth it. 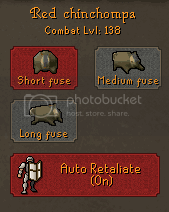 Great guide, I hope to use it to get 99 range when I get lucky at God Wars.